FRESNO, Calif. --An underdog city in Central California has been slowly transforming its image, and its love for the arts has been a big part of its makeover. Often ridiculed for its bad air, high unemployment and scorching summers, Fresno has been cultivating an artistic vibe that has drawn and encouraged new and interesting businesses. Behind these changes are many Latino artists and entrepreneurs. 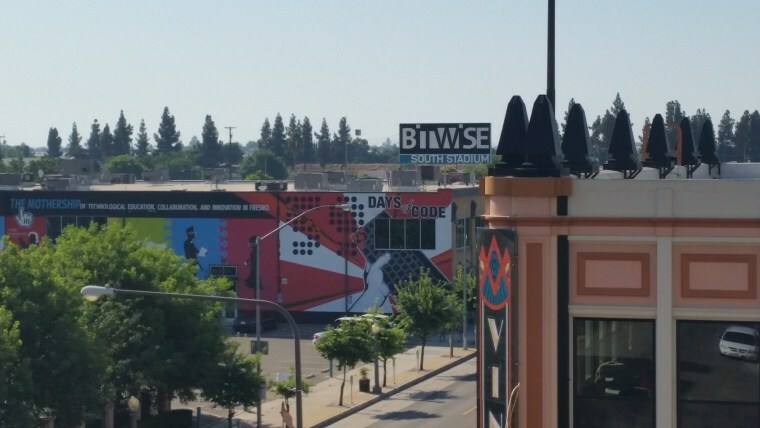 They're making an impact in downtown Fresno, an area that’s seen a flurry of activity since 2013, when the city made its big push to revitalize it. “There’s always been a need for Fresno to have its own thing. You have to really work at it,” said Fresno’s new poet laureate Bryan Medina, a gentle man with long twisted locks who is the founder of the Inner Ear Poetry Jam. “There was always the artists; the art was first. Now, the city has come around. It’s revitalizing downtown, it's giving people something to do here," said Medina, who is of Haitian and Mexican descent. Medina describes the transformation of the city's downtown as trying to create the best torta, which takes time and the right ingredients. Come September, its $22 million project will bear fruit when Fulton Street, a pedestrian mall, opens up to vehicle traffic. A string of restaurants and three Latino-owned local breweries will follow along with the expansion of existing restaurants and the opening of another brewery. In addition to new restaurants that tend to bring in nighttime traffic and nightlife, several businesses have been contributing to the revitalization of downtown by partnering with organizations or events created by the arts and literary arts community. Some of these businesses are led, founded or co-owned by Latino professionals. Michael Cruz, 32, is president of Tioga-Sequoia Brewing Co. He's a local who decided to stay in his city after graduating from California State University with a business degree. He decided to place his microbrewery in downtown Fresno, he said, to make a difference. “We decided to put it in downtown because it was the soul of the city. We thought it would be a key component of revitalization,” Cruz said. His brewery has a tasting room and beer garden which serves as a cultural, multi-purpose venue. "We work with artists weekly, from musical performances to art shows - even the foodie scene takes a part in our events,” he said. Bitwise Industries, a hub for growing technology businesses, was co-founded four years ago by Irma Olguin Jr., an engineer who hails from a family of field laborers in Caruthers. Olguin wanted to provide a space to start technology businesses for locals and provide access to technology, especially for rural communities, said Sal Lucatero, special assistant to the CEOs of Bitwise. “Bitwise was created to stop the brain drain," said Lucatero, addressing the loss of educated young people who leave Fresno to look for opportunities. About half of Fresno's population of almost 495,000 is Latino. The building includes Geekwise Academy, a training and educational program for locals, and Shift3 Technologies, which works and helps local businesses with technology services. In the next two years, Bitwise Industries will grow with the addition of two buildings. Bitwise Industries partnered with the Inner Ear Poetry Jam by providing its stadium as a space for poetry readings. One Sense, a technology company, also partnered with local artists as well as with ArtHop, an event where local artists can display their art to the public in galleries and museums. Downtown today houses some new apartment buildings, new eateries and trendy food trucks to attract the hipsters. At Fulton Street, there’s the Chukchansi Park stadium, where people come and watch minor league baseball games. Nearby, there’s Cruz's Tioga- Sequoia Brewing Co.. Across from it, a five-story loft building is projected to be built after the opening of Fulton Street. Three new restaurants are expected to open too. “It was purely organic. Once it was announced that Fulton Street was opening to vehicles, downtown Fresno has seen over $100 million in new investment. Construction of 200 apartments has already been completed with another 500 in planning and almost 40 new businesses have opened or announced their openings,” said Mark Standriff, director of communications for the City of Fresno. “It is rare that any one thing can be attributed as the cause for the transformation and revitalization of a city, but art in Fresno has certainly been one of the most significant attractions to the downtown area,” said Lilia Gonzáles Chávez, executive director of the Fresno Arts Council. Before the Fulton Street project, artists scrambled to develop ways to showcase their work to the public and offer the community the opportunity to engage in poetry and artwork. Downtown had little nightlife, a few thrift stores and several old abandoned buildings that were eye sores for years. Then in 1996, ArtHop happened. Artists, the Fresno Arts Council and the city established the event to contribute to the revitalization of downtown, Gonzáles Chávez said. Art galleries started to open in different sections of the city. Later, the Inner Ear Poetry Jam was founded in 2002 as an open-mic event at the Kern Street Coffee Shop on Kern Street. “I wanted an emphasis on reading…It got so big we had to do it on the street,” Medina recalled. Now, the Inner Ear Poetry Jam is held at Bitwise stadium, an auditorium tucked in a corner inside the building. One of the attendees at a recent jam was Tim Hernandez, a Fresno poet and a creative writing instructor in El Paso, Texas. “It’s fun to share and the more we share, the more we have in common than differences. In these forums, we all support each other. When we step off the stage, we go out into the world and we conduct ourselves like that." Last year, local poets Lee Herrick and Juan Luis Guzmán launched LitHop, a festival that spotlights the city's literary legacy. “I wanted LitHop to be as diverse as possible because I feel that’s where we are at our best,” said Lee Herrick, Fresno’s former poet laureate and writer. Fresno's Juan Felipe Herrera was the nation's 21st Poet Laureate and the first Latino to hold this position. Fresno is known as the birthplace of many famous writers, from William Saroyan to former U.S. Poet Laureate Juan Felipe Herrera. Other Latino literary giants from Fresno include Gary Soto and Margarita Engle, a Cuban American young adult writer from Clovis, an area in Fresno County. Engle is the author of "The Surrender Tree: Poems of Cuba's Struggle for Freedom," a Newberry Honor winner, as well as "The Lightning Dreamer: Cuba's Greatest Abolitionist", a PEN USA Award winner. She recently became the first Hispanic to be named the nation's Young People’s Poet Laureate. Herrera tells NBC News that his city is the “capital" of poetry. "I see growth in all things, Latinx writers are exploding all over the nation, here as well," he said. There are new Latina art groups opening up arts spaces and Fresno State has new Latinx art and writer groups, said the former poet laureate. "However, most present are the poets, moving here and there,” said Herrera. Medina, Fresno's new poet laureate, describes the contributions of the arts and literary scenes in the city's revitalization efforts as “homegrown.” In the past, people would have to drive to Los Angeles or San Francisco for entertainment, he said.